For those of you who’ve never heard of it, there’s an organization called Twin Galaxies that keeps a catalog of video game world records – you can read some more about it here. If you’ve seen King of Kong, for example, you’re probably familiar with Twin Galaxies. Anyway, a new EarthBound world record was made a few days ago: a verified, real-life run of the game was completed in 6 hours, 38 minutes, 16 seconds by Chris Corsi, aka EBchamp. You can see the page about it here. I was able to beat the game in 6 hours 38 minutes 16 seconds (the stop watch was a little off). 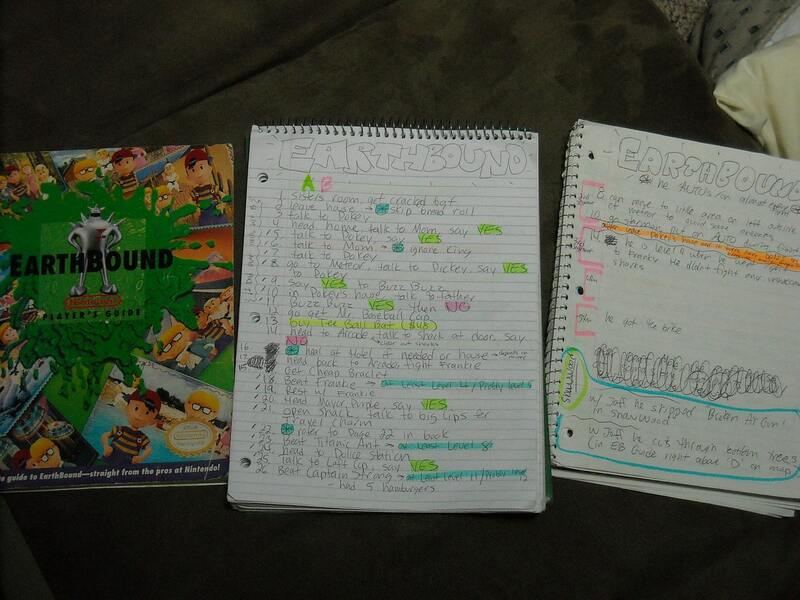 I have also attached some pictures of some of my notes that were taken, the stop watch with the record time, and the setup we had going. I have beaten my record three years in a row (I do the record run once a year) and I was very pleased with this time. I thought this was some interesting Earthbound news and figured I would share this with you. This is really cool – I’ve always been really interested in seeing just how quickly someone can get through the game in one sitting, and now there’s a world record people can point to and try to improve upon themselves! Hmmm, I wouldn’t mind giving that record a try when I get the time to do so. But excellent job on receiving that honor. I wonder if there’s room on there to add “Most Enemies Killed In A Single Battle” to the list? Whew, that’s undeniably an impressive record. I certainly couldn’t come close, though that’s probably because I don’t play anywhere near as much as I should. I could never do that well. good job! I say this because doing the game that fast must take alot of work and thinking. Thanks guys! It’s definitely taken me a lot of time and effort, but it is worth it. @Ninji – I actually had the record 2 years ago, my time was terrible (11 hours and 30-something minutes). I sent in my record of 8 hours and 15 minutes last year and it got verified only about a month after Marc Merica’s record was verified. I felt kinda bad because he was probably happy to beat my record (of eleven and a half hours) but then lost it almost immediately. Also, the 68.69% that Marc Merica has is the percentage of his time compared to my time (he did complete the entire game). Wow, did you fill up both those notebooks with notes? Yes EBChamp you are right! This is Mike Halphen, Chris’s best friend of 23 years- I was right there to witness it all! >>August 2009: Marc Mercia, new #1 – 9 hrs, 39 min, 48 sec. >>July 2010: Chris Corsi beats his already #1 record – 6 hrs, 38 min, 16 sec. Just seeing that collection frightens me to think that in a few years my area might be like that….. If I still had my cart I could probably contend with the score. I think I beat it already one run back in ’01 when I got around 6 hours. I had similar writing but on a computer instead of a notebook. 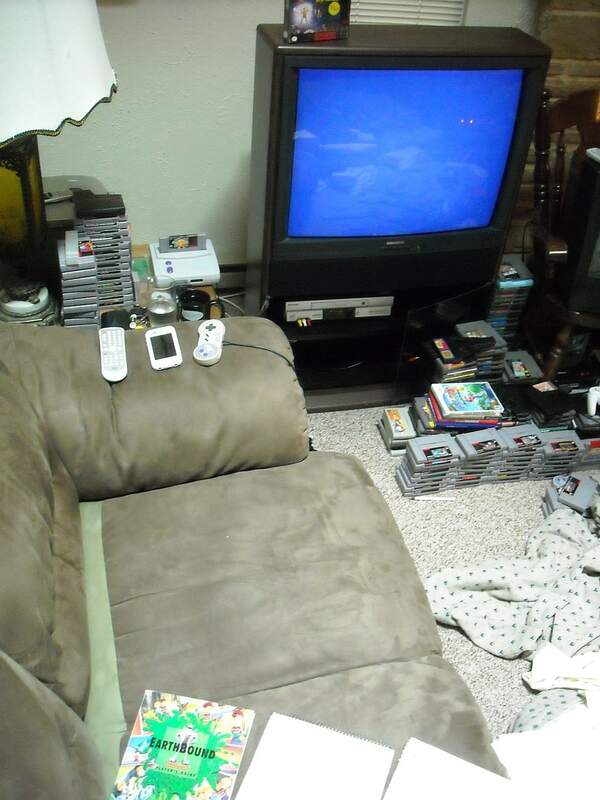 wait is that an Out Of This World sealed on top of the tv?? Thanks for all the comments! I’m glad this was an impressive time because I could not find much on a straight playthrough speedrun of Earthbound so I wasn’t really sure what was considered a good time. @MG – I didn’t fill up both notebooks fully, but I did use a good amount. I think there ended up being close to 150 steps (just from the one notebook). @EBGod – It’s a shame you don’t have your cart anymore cause it would be cool to drum up some more competition. At least you know where to look now if you get the chance to take a shot at it. @UncleFester – Yes! My brother is a huge fan of Out of This World and has an H-Seam (sealed) copy of it. Good eye! Yeah, I also first head of Twin Galaxies thanks to the King of Kong documentary (which is excellent by the way, I recommend it). That’s definitely an impressive record. I’m playing through the game again for summer I’ve probably put around 5 hours into the game already, and I just beat Threed. I just wanted to say, you have an amazing SNES collection. How can you even verify he didn’t just cheat or speed up the game? c’mon now there is a lot of editing that can be done. 100% in 6hrs? Don’t think so. @ Anonymous – The 100% does NOT mean 100% of the game is completed. It has nothing to do with in-game play. Twin Galaxies has that percentage listed next to EVERY game record. They refer to the number one record as 100% and each other record as a percentage of that particular number one record. If you look at the rules for Earthbound, (check the posted link) the only requirement for the record is to just beat the game in one sitting. Thats it. I seen people beating EB in 4 hours by using Zsnes Emulator and using fast speed and cheats (like walk thru walls, Max stats, no ememies attack etc…) so that would count? because I bet he used that too . it’s extremely easy for one to cut the video and use cheats. Anyways if he really did it 100% legit! then congrats I am not trying to offend anyone. Videos are watched and verified by the people at Twin Galaxies, they specifically look for cheating and stuff like that. So if it was accepted as legitimate, then there wasn’t any cheating. @Anonymous – For the Earthbound record to be verified you just have to beat the game without using cheats, hacks, or glitches. I beat the game in one sitting using a SNES hooked up to a VCR (as seen in the pictures) without cheating. As Team Mountain said, each person that holds the #1 record (in any game on Twin Galaxies) has 100% listed next to their name. The other records (second, third, fourth, etc.) then have a percentage of the #1 record in that particular game listed next to their name, for example, Marc Merica’s time compared to mine was 68.69% of my time. 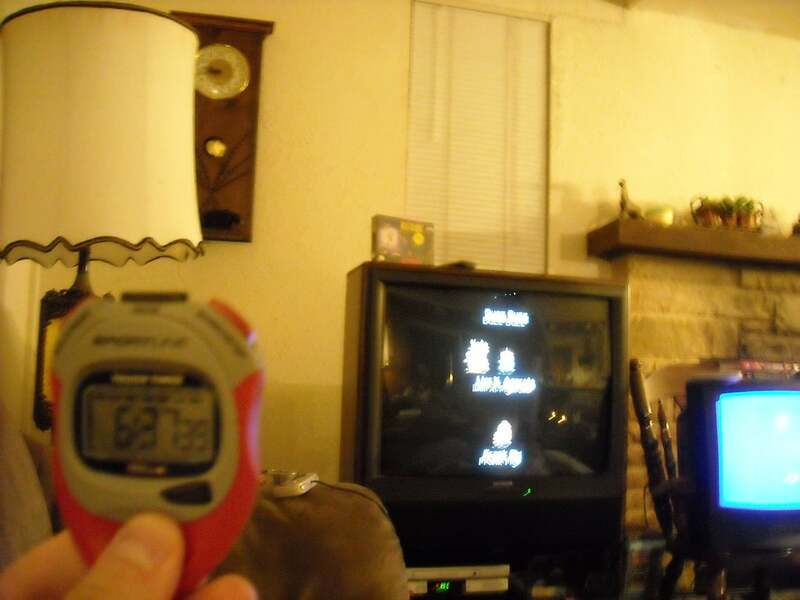 Also, I had my speed run recorded on VHS and sent them to the designated referee for Twin Galaxies (that verifies SNES games) and he verified it. I do have my speed run recorded on DVD (I had it transferred to DVD from the VHS) and I could try to post it somewhere at some point. If I do I will keep you guys informed in case anyone would be interested. Cool that is simply awesome! I am a professional Rapper and I love Earthbound to death! Anyways, congrats on the speed run! See, this is exactly why I wish I had an SNES and an official cart of Earthbound. My record though the game without using any emulator options such as turbo, save states or cheats and with using a controller is actually 6:06 after delivering the final blow to Giygas. Skip the sword of kings, fight when necessary and don’t die. Ever. didn’t chuggaaconroy attempt this and then there was a power outage or something?? Anyway holy cow that is fast!!! Amazing! It takes me at least 30 hours to beat EarthBound! I go for 1/128 equips, FYI. 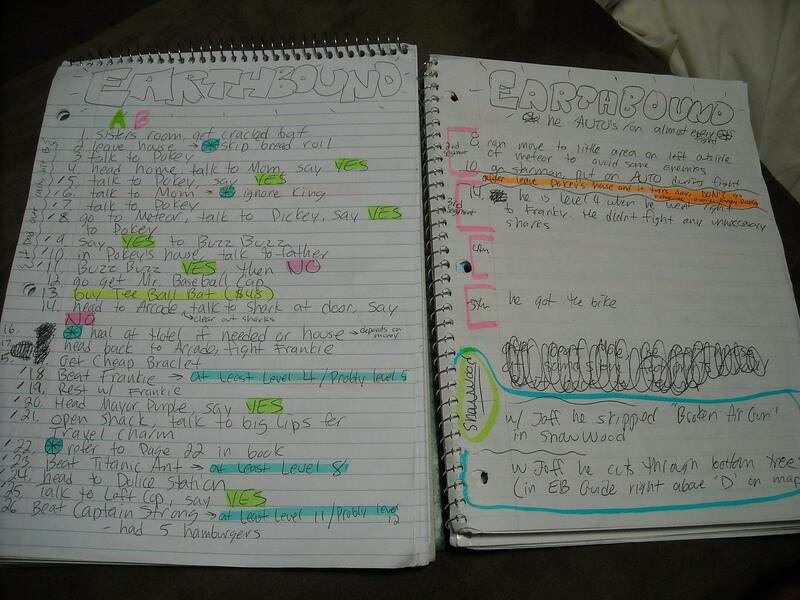 Looking at some of this guys notes, i don’t know how I would survive! I like to beat Frank around level 7, but not level 4! How does he stay alive? I just stumbled upon this page today. I’ve been aware of the fact that Chris took his EB record back in decisive fashion, but never knew this site existed, or that EB had such a following after all these years. Ninji (and others), I think it’s a bit dramatic to suggest I feel like dirt, haha! Or that I didn’t get properly recognized for the accomplishment. I’ve submitted a number of records to TG and am impressed that they acknowledge most of them via forum announcements, something I wouldn’t have expected. Although I hadn’t played the game in years until that run, I normally play like most of you–uncovering everything! When I set the previous record back in ’09, I remember it was a hot summer night and I couldn’t sleep, so I played EB all night long. Had it not been for a friend watching me play and occasionally (frequently?) giving me coffee, I might have turned into an actual zombie. I’ve been wanting to see if I can break Chris’s time, or at least come close, but these days it’s difficult to try and set large 6, 7, 8+ hr blocks of time aside for things like this. There were plenty of mistakes in my run and I didn’t take such meticulous notes. Hey Marc! Great to hear from you! Good to hear from you. The wingman is critical! I don’t think I’d want to play by myself for that long without one. I remember getting the game as a kid back in ’95. I’d played RPG’s before, but never anything close to EB. I’m glad I found this site as I now understand the history of the series a little better. I did play the fan ROM (Mother 1 + 2 I believe) a couple years ago, too, and got sucked right into that as well, heh. I can certainly improve my current time, but by 3 hours? I don’t know. Definitely going to have to do my homework and take some more chances. Just looking at these few pictures tells me you guys did a lot of studying…maybe I need to increase my wingman’s wage (kidding). I got really sloppy in Moonside and wasted a lot of time there, for example, and a few other places too. To get a time like Chris did, I’m sure you had him hitting on all cylinders. Even if I can’t beat Chris’s time, I’ll submit a new score as long as it’s an improvement over the current one. Just a matter of finding the time to try it! I’m not normally a fastest completion/minimalist speed run type player, but after playing EB so many times and doing everything possible, it was the only new reason to play the game again. I imagine Chris feels the same way! @skateman I tried that for M3 but used save after using save frogs cuz when I only used save frogs they wouldnt work D: and I completed chapter 1 in one sitting. OH EHM GEE!!!! I don’t think I’d able to pull that off without TASS. Looks like they changed their site system despite still looking like a 1998 Geocities site. I think you have to sign up on their site to see the scoreboard stuff now, bleh. When does timing start and stop? My first instinct is it ends at the “the end” screen after Picky knocks on the door, but it looks like you stopped timing earlier than that. I would assume timing starts when you click the last “Yes” on the naming screen? Sorry for double post, but, I’ve been looking around, and can’t find a video of this. Was it even recorded? I’d love to see it, if it was! I’m pretty sure you have to record your gameplay when submitting to Twin Galaxies, but I don’t know if the actual video is online anywhere. Sorry for such a late response on some of these posts. @skateman222, that’s awesome! Glad there will be some more competition. Good luck in your attempts! @lostaname, I believe Mato is right, they changed the way you can view scores and I think you have to login now…and yes, it definitely looks like a Geocities site lol. @Bread, I said it in an earlier post, but if you think you can beat the time then go for it! The more competition the better! Also, like Mato said you have to send in a recording of the speed run and when you do you don’t get the video back. Fortunately I made a copy of the run onto DVD and I have it somewhere, just not sure where. If I ever feel up to it I will try to post it somewhere so people can view it. If you do find the DVD but find it’s a pain to post it, you could send me a copy and I’ll see if I can find a place to put it. Six hour videos are probably pretty big though, I wonder where a good hosting site would be. I will definitely look for the DVD and see if I can find it. I actually have a website (www.teammountaingaming.com) that I could probably upload it to, but I’ll let you know if I do find it and if I get around to posting it. im STILL stuck in Threed! The mini barf is hard to beat without PSI and Jeff and Paula. ( I have not even enought to stay in the hotel!) Please help me!